Using a belt means that you can adapt the cover to fit various spine widths. 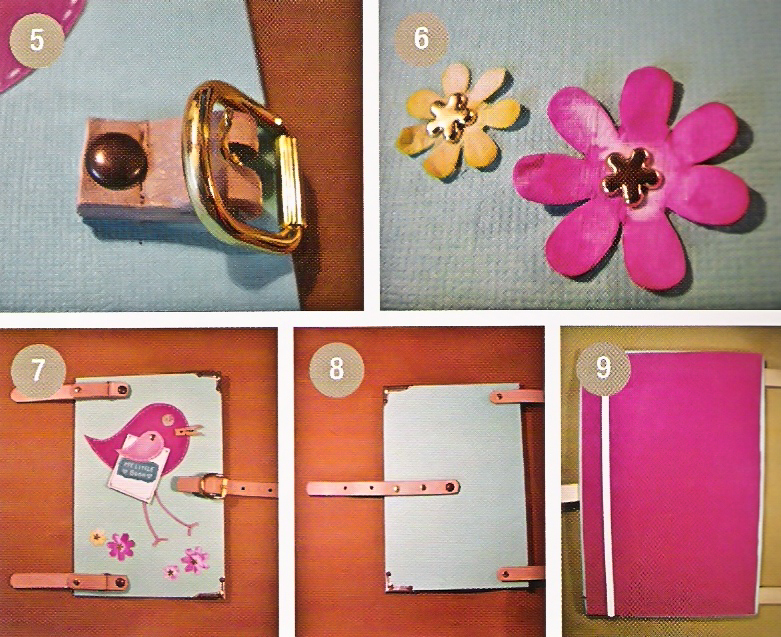 Instead of a belt buckle as a book fastener, you could also try a button and cord or even ribbon tied in a bow. 1 Using a craft knife and metal ruler, cut out two 13.5 x 20 cm rectangles from book board or suitable thick card or measure the book that you want to cover and cut out two rectangles at least 0.5 cm wider and longer than the original book. Be sure to use a cutting mat or board to protect your work surface. 2 Cut out two rectangles 14.5 x 21 cm from the light blue textured craft paper (or at least 1 cm wider and longer than the book board). Cut the corners of the textured craft paper so that it will fold over neatly when you wrap it around the book board. Cover the back of the book board with PVA glue, using an old paintbrush to spread it evenly. Stick the textured craft paper to the book board, wrapping it around the edges of the board and gluing it securely at the back. 3 Draw on the simple sheet of paper the simple shape of the bird (see pictures). Cut out the shape for the birds body in dark pink textured paper and the wing in medium pink texture paper, making it proportional to the size of your book cover. Using a white gel pen, draw a line in dashes to look like stitching around the edge. Glue the body to the front cover, but save the wing to attach later. Glue two pieces of pink cord to look like legs and two shorter pieces to look like feet under the bird’s body. Glue a button as a n eye and a mini clothes peg as a beak, or using a bradawl to make a hole, insert a brad for the eye and two pieces of cord as the beak. 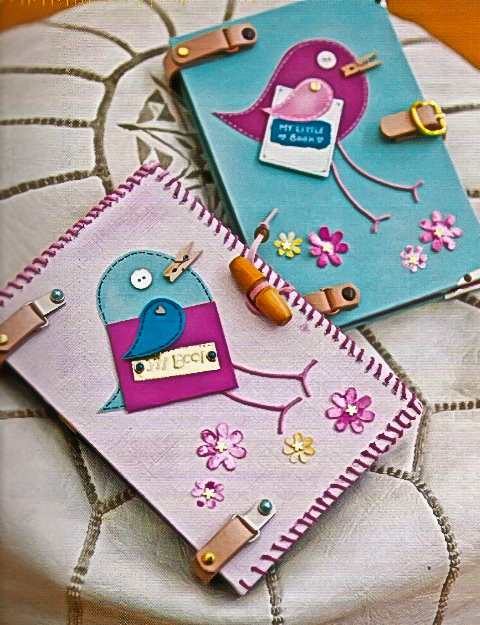 4 Make a ‘mini-book’ to fit under the bird’s wing. Cut out a rectangle (4 x 5 cm) from book board and a rectangle (6 x 7 cm) from the pale pink textured craft paper. Cut the corners of the textured craft paper and glue to the board, wrapping the edges around and securing with glue at the back. 5 Tear a small square of medium blue craft paper and write a title of your choice on it with a white gel pen and glue to the mini-book. 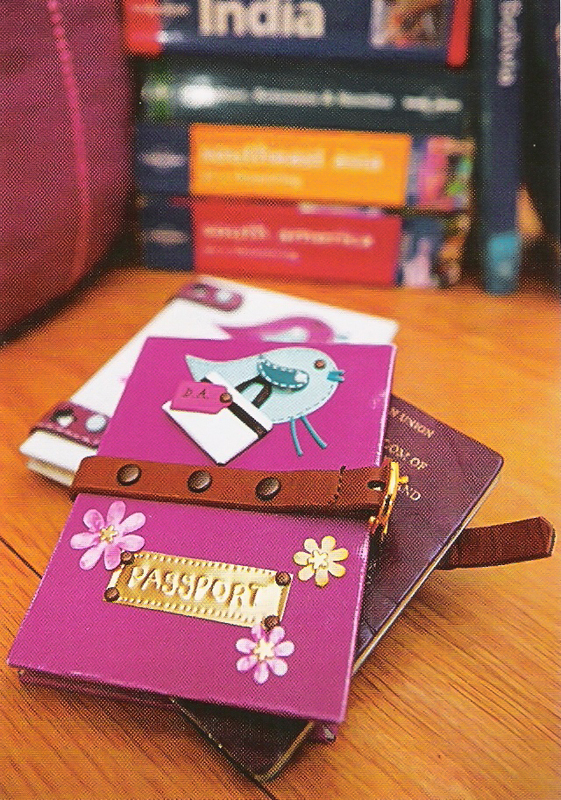 Glue the wing over the top of the mini-book and attach a ‘spacer’ underneath the the top of the wing with glue. You can cut out a small square of book board to use as a ‘spacer’. Attach the mini-book and bird’s wing to the bird’s body with a brad (image 3). 6 Use silver metallic foil to create book corners. Cut the foil into a shape that will fold around the bottom outer corner of the front cover and secure in place with two bronze and one gold brad. Using a bradawl, add a dotted line as decoration (image 4). repeat this for the top outer corner of the front corner and the two outer corners of the back cover. 7 Cut a skinny belt into six pieces as follows: the belt buckle with strap still attached; one strap with the holes, at least 15 cm long; two straps without holes, at least 3 cm long. Attach the belt buckle to the front cover with a large brad (image 5). 8 Fold the two 12 cm straps (without holes) around two D rings. Then fold the two 3 cm straps (without holes) around the other side of the D rings. Secure to the front cover with two large bronze brads and two gold brads. Add the flowers as final embellishments securing in place with decorative gold brads (image 6). You have now completed the front cover (image 7). 9 Secure the strap with holes to the back cover with one bronze and two gold brads. make sure it is aligned with the belt buckle on the front cover. Wrap the strap around the book and mark with the pencil on the back cover to ensure that you attach it in the right place. Attach the straps without holes to the back cover with gold brads, ensuring that the straps are in the correct alignment with the front cover (image 8). 10 Cut two pieces of thin elastic to measure at least 25 cm each, or at least 5 cm longer than the length of the book cover. Fold over the ends and attach one piece of elastic to the inside of the front cover and one to the back with the glue. Cut out two rectangles of dark pink felt 13 x 20 cm, or a few millimetres smaller than the outer edge of the covers. Use PVA glue to attach the felt to the inside of the front and back covers of the original book under the elastic and fasten the belt buckle to secure in place.